If you rearrange the letters in ‘Nine Day Queen’, you get ‘Deny A Queen In’ – which was exactly what happened during Lady Jane Grey’s ill-fated stint as Queen of England. 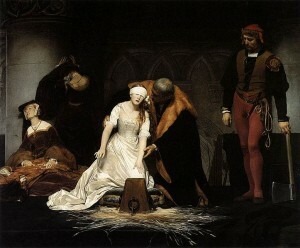 Problematic as it was fearful, the seventeen-year-old aristocrat is forever remembered for her infamous execution on Tower Green in books, movies, artwork, and songs, lending her a legacy that she might have had in her reign if she had not died so abruptly more than four hundred years ago. Jane was born on October 12, 1537. A devout Protestant and student, Jane was educated at Hatfield along with other members of royalty such as Edward VI, Elizabeth, and Mary. She excelled at her studies and rejoiced in being far from her parents, Henry Grey (duke of Suffolk) and Lady Frances Brandon, who were ambitious and harsh. Jane was under the guardianship of Catherine Parr, sixth wife and widow of Henry VIII, and the two were close, so much so that Jane stayed with Catherine and her husband, Thomas Seymour at their estate on Gloucestershire when their daughter was born in 1548. However, Catherine died a week later and Jane, then eleven, was chief mourner at her funeral. When the young King Edward VI’s health rapidly succumbed to illness, his advisor, wily John Dudley (duke of Northumberland) devised a scheme to keep himself in power. Late Henry VIII’s will stated that if Edward died without child, the throne would pass to Mary, and if she died without child, to Elizabeth, and finally, if she died without child, to Jane. Cunning Dudley swiftly became Jane’s guardian, married his son, Guildford, to Jane (much to her dismay) in a hurried ceremony and convinced the dying king to name Protestant Jane as his heir, which would render his son the husband of the Queen and their bloodline immunity in Jane’s reign – which, of course, never really happened. Jane was a clever girl who did not want to be Queen and saw the crown as an inescapable duty. I do not think of Jane as timid or weak, but brave because nonetheless she wore that crown and did not try to renounce her actions even as she walked past the cart holding her husband’s corpse and onto the scaffolding before her own relative, Mary, who had signed her death warrant. Queen Jane’s reign did not see any great achievements in science, the arts, or government. No important laws or taxes were passed. As Queen, Jane did little, but perhaps the quickness of her reign and its macabre end was by far her most impressive legacy. The unfortunate circumstances of her death make her an almost martyr-like figure, a victim of society. To me, Jane is famous because she is a symbol of how brutal people can become when power is at stake. She reminds us that humans are very fragile.